I try to do an overnight backpacking trip each year. I was hoping that I might be able to do one the weekend of September 10, 2016. Unfortunately, the weather was not predicted to be very nice Saturday; hot – highs around 90 – humid, and a good chance of thunderstorms, some possibly severe. So I decided to just do a single-day hike on Sunday. I started, as I usually do, loading my gear into the car in the pre-dawn darkness. As I was loading it began to sprinkle, but I expected this; I had looked at the weather radar and a front was pushing into the area. It had already cleared past the trailhead to the west. I got on the road as the sky began to lighten. It rained a little at the start of my long drive west, but I soon drove out of it. 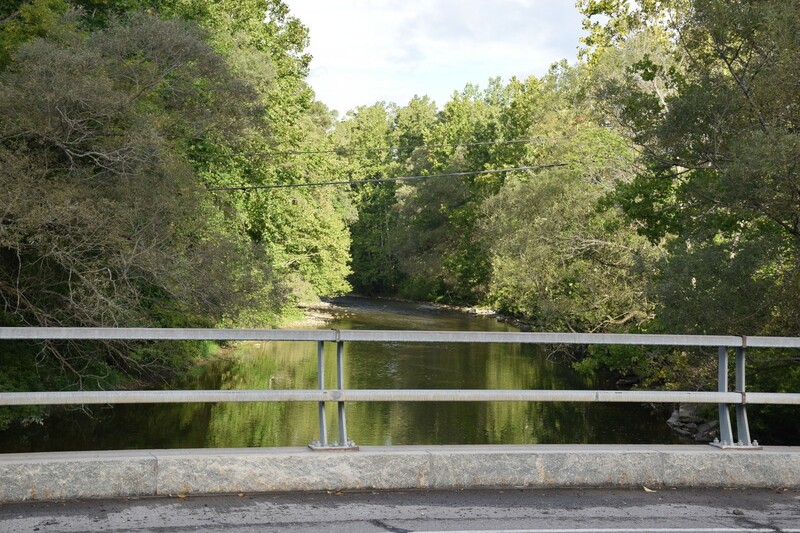 An hour-and-a-half later I pulled into the DEC parking area alongside the Cohocton River on NY 415 just west of Bath. 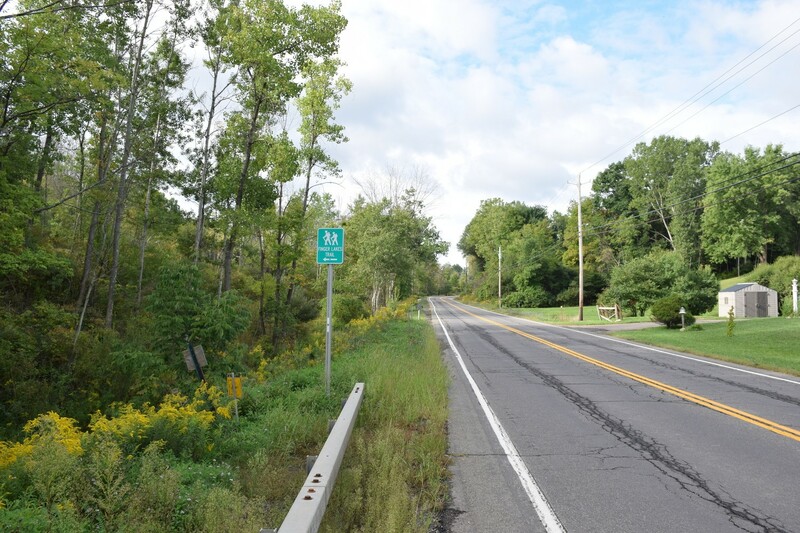 I changed into my boots, and set out along NY 415 heading east. I planned to hike east to my last turn-around point on Sandpit Road and then turn around and head west, back past my parking spot and on out to Craig Road before coming back; a total of about 20 miles. NY 415 was busy and I had to wait for a number of cars to pass before I could cross to the opposite side. I continued on up the road, passed under the I-86 overpass, and then turned left onto Spaulding Drive. A short walk on Spaulding Drive and then I turned left and headed up Harrisburg Hollow Road. I passed a row of small houses on the left that sat up against the side of the hill. The sun was starting to break through the clouds and shine down the road. Wet areas still dotted the road from the rain earlier. I saw an old man out on his front porch; we greeted each other with a “good morning”. I turned right onto Sandpit Road; it changed quickly from paved to dirt and gravel. As I rounded a corner I saw the spot that I had turned around at last time. I walked up the trailhead (mile 1.1 – 8:33 am), took a few pictures and then turned back. 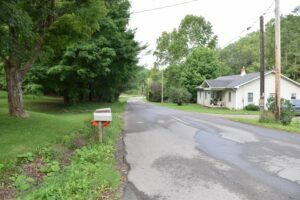 I turned left onto Harrisburg Hollow Road and back down past the house where I had seen the old man earlier; he was back inside now. Soon I was back on NY 415 and crossing under the I-86 overpass. 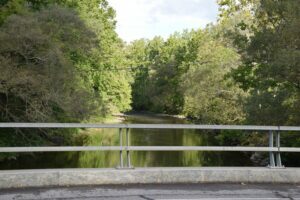 I turned left onto Knight Settlement Road (mile 2.1 – 8:52 am) and crossed over the Cohocton River. 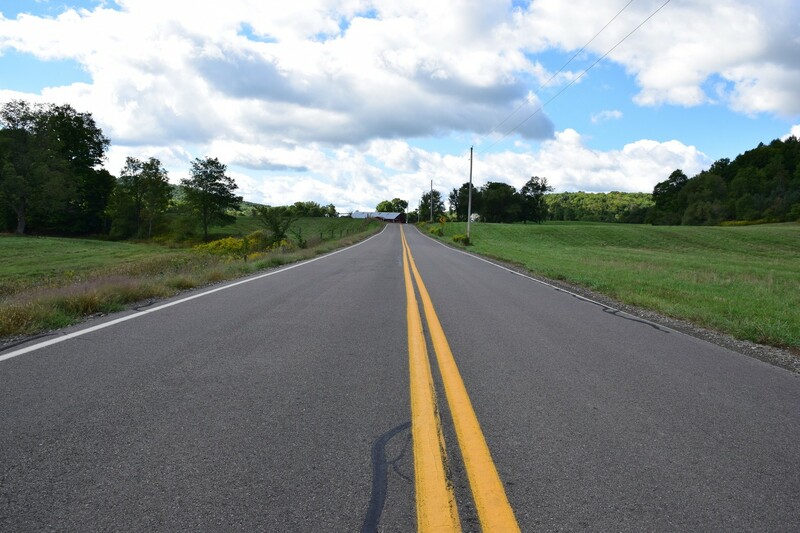 There was no shoulder on the road, so I walked on the white line at the edge of the road. When cars came down the road I would step off to the side. After crossing over the river I came to a railroad crossing. From there I walked past a sand and gravel company and on around a bend in the road. As I continued on up the road I saw a small post at the side of the road with a sign warning of hogweed . The hogweed was now dead and dried, but I left it alone. 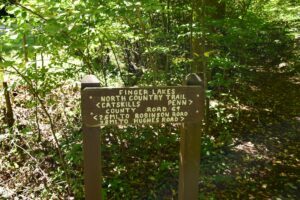 After about 1.2 miles the road crossed over a small creek and a green and white metal FLT sign indicated the trailhead (mile 3.2 – 9:15 am). A yellow FLT placard also marked the trailhead, which was good because the path was completely overgrown. I waded through the tall goldenrod and weeds searching for a clear path and a white blaze. I found both a short distance later and the path began a short climb before turning right to parallel the road I had just left. The trail was narrow and overgrown in many places; the brush slapped at my arms and snagged at my sides. A few small trees had fallen to hang across the narrow path forcing me to crouch and crawl under them. After continuing along a straight path the trail turned to the right and wound through some ATV trails. I had to search for the blazes several times as the trail weaved through some overgrown areas. Soon I found myself descending out onto Knight Settlement Road once again (mile 3.8 – 9:32 am). There was another green and white metal FLT sign on the opposite side of the road indicating that the trail crossed here. There was also a post with a double white blaze painted at the top of it indicating a turn in the trail. I climbed over the guard rail at the side of the road and carefully picked my way down across a gully and then back up the other side. A short distance up the hill the trail faded into the overgrowth and disappeared. I could not find a blaze and there was no obvious path. Finally I found a narrow overgrown path heading at an angle up to my right. I followed it up and then back left past a white tag hanging from a large bush and then it disappeared once again into the brush and weeds. 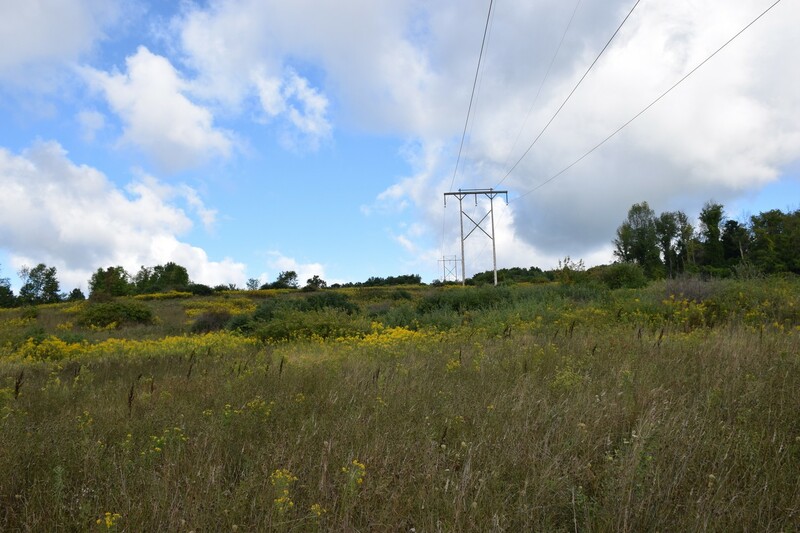 I looked up the hill and saw that I was in a power line right-of-way. There was a large power pole further up the hill and I decided to work my way up to it and keep an eye out for the white blazes of the trail. Periodically I found some blazes, but there was no clear path through the brush and weeds. I slogged up the hill making my own path at times or following small animal tracks. As I drew closer to one of the large power poles I saw a white blaze marked on it – at least I had gone in the right direction. I turned to look back behind me and saw a great view. From the power pole (mile 4.1 – 9:42 am) I found a path and some blazes taking me up toward a field, but I quickly lost the trail again. I decided to just follow up along the edge of the fields. 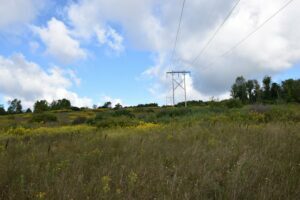 At the top of the first field I found another post with a white blaze on it; it had been overgrown by tall stalks of goldenrod. I tramped down around it to help other hikers after me before continuing on up. I crossed another field again having to search for the post. Finally I came out on a mown area that passed up along a goat pen. The goats looked at me curiously and began to bleat as I got closer and started over to investigate me. I looked further up the hill as the goats continued bleating at me and saw a house, I realized that I was on the wrong side of the field. I turned back and found a place to cross over the brush that separated the other side of the field and then continued on up. At the top of the field the trail opened out onto Cochrane Road, a dirt and gravel road (mile 4.7 – 10:01 am). The road continued a small climb up to the top of the hill. At the top of the hill I was greeted with incredible panoramic views of the hills and valleys all around. I was also blasted by the strong wind. I cinched my hat down tight on my head to keep it from flying away and leaned into the wind to make my way forward. The sweat I had worked up climbing the hill was dried quickly. I could see some large wind turbines spinning on tops of hills in the distance. I took many photos of the views before leaning into the wind and pushing on. As the road wound down into the valley below I passed by an old farmhouse, now boarded up and surrounded by cows. The cows saw me and started to come closer, perhaps they thought I would feed them. They followed me for a short distance as I continued down the road, but I soon left them and the old farmhouse behind. Cochrane Road came to a junction with CR 14 which was paved and had a double yellow line down the middle (mile 5.6 – 10:28 am). I turned left onto the road and continued my way along. As with Knight Settlement Road there was no shoulder, so I walked along the white line at the edge of the road, but there was much less traffic on this road; only two cars passed by me heading the same direction I was walking. After a short walk I turned right off CR 14 and on to Sinclair Road, another dirt and gravel road (mile 6.0 – 10:36 am). I continued along this road under the bright sunshine; It was beginning to warm up. 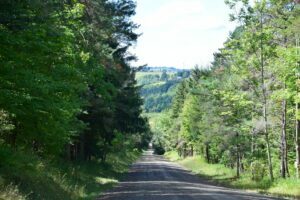 I came to the trailhead and left Sinclair Road behind heading up a tractor path near some fields (mile 6.6 – 10:47 am). A quick climb up the path and it opened into a field and continued up along the edge. Corn stalks grew high in the field. Near the top of the corn field the trail turned to the left and headed into the woods. A few moments later I came to a trail register and decided to take a break and get some water and a snack. I finished my break and left the register behind. The trail continued to climb and soon opened out into a field once again. The field was rough and rutted in places and walking was difficult. I came to the top of the hill in the field and started a slight descent down to Robinson Road. I crossed Robinson Road (mile 7.7 – 11:36 am) and walked down along a hedgerow at the edge of a yard. As I reached the bottom of the yard I realized I had taken the wrong side of the hedgerow. I turned around and headed back up and then down the other side along the edge of a small field. The trail turned into the woods at the bottom of the small field and continued for a short distance until coming to a small stream. At the stream it turned to the right and opened out onto another dirt and gravel road, Gay Gulf Road. The road crossed the stream and climbed up a small hill. A short walk later I came to a farm (mile 8.4 – 11:53 am). The trail turned off the road and up the farm lane past the farmhouse and the barns. 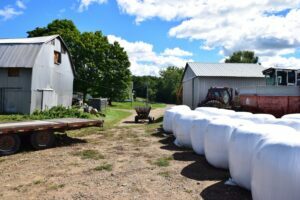 I walked up past the barns and around numerous hay bales. I looked around for the owners to say “hello” to them, but no one appeared. At the corner of the stacked hay bales I searched for an FLT marking and found that the farmers had written directions on the white plastic covering of the hay bales with black permanent marker. I continued up along the side of a somewhat overgrown field. As I got closer to the next road crossing I saw a house ahead of me. 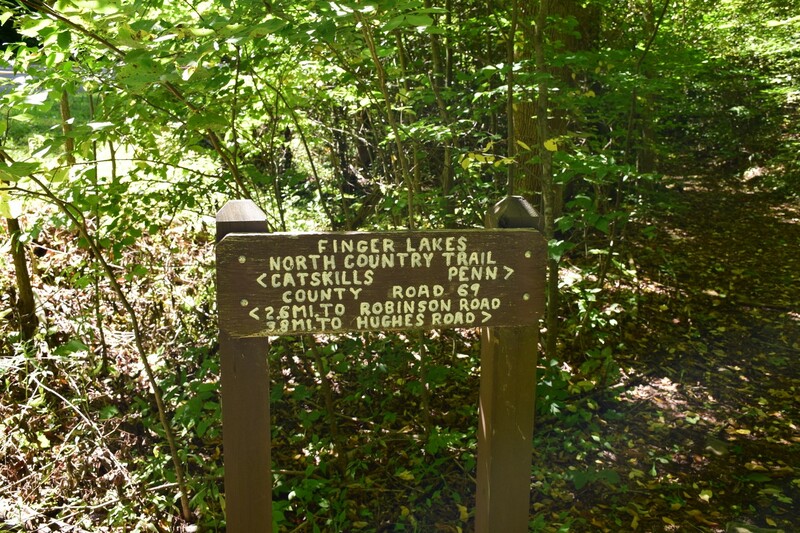 I looked around for the white blaze of the FLT, and saw it – further back in the woods that ran next to the field; Once again I had missed another turn on the trail. I left the field and pushed through the undergrowth and back on to the trail in the woods. The path wound through the woods and then came to Snell Hill Road (mile 8.9 – 12:05 pm). I turned to the left for a very short walk on the road and then turned right up a dirt driveway. A blue and white stripped party tent sat in front of a house next to the drive. Tables and chairs were stacked under the tent. I climbed up past the tent and along the edge of another field. At the top I saw two pickup trucks parked and a sign noting that there was an archery practice range nearby. I did not see the owners of the trucks and continued on down the trail which followed a wide dirt farm road. As the farm road neared another field the trail turned to the right and continued through the woods that bordered the field. After a short distance the trail turned right and came out onto another farm road. I decided it was time for another break and sat down for some water and a granola bar. After a short break I continued on and the trail turned back into the woods leaving the farm road behind before coming out on to CR 69 (mile 9.8 – 12:34 pm). On the opposite side of the road was a wooden sign indicating the mileage to cross points on the FLT in both directions. 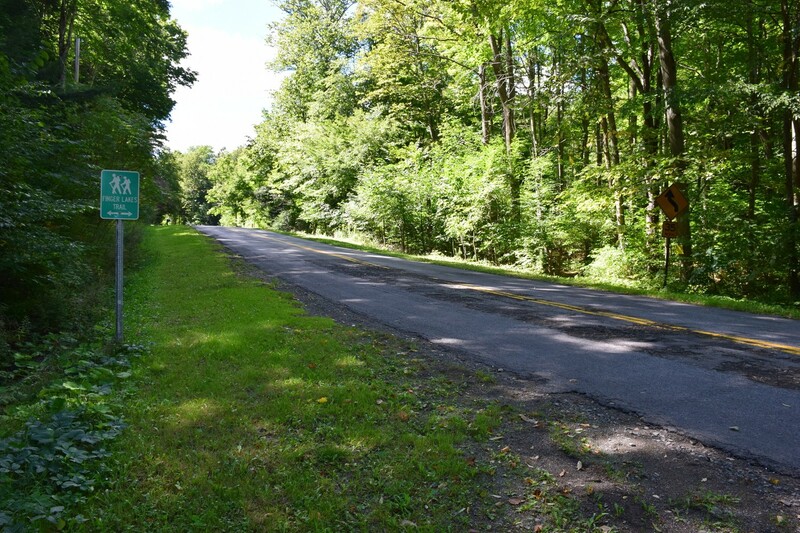 The sign indicated that Hughes Road was 3.8 miles ahead of me, but I was going to turn back before I reached that far. The trail wound through the woods, crossing some ATV trails. This was probably the longest section of woods I had encountered on this hike. 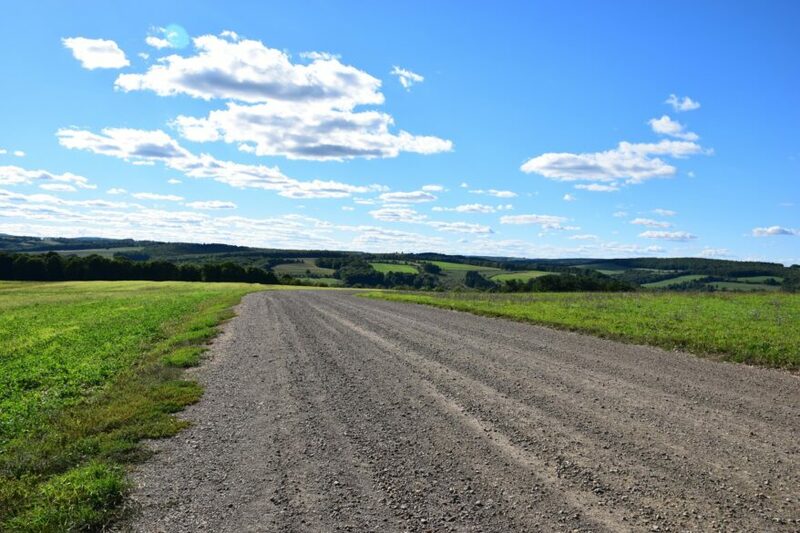 After a while I came to Harris Hill Road, another dirt and gravel road (mile 10.6 – 12:58 pm). I turned to the left on the road and climbed up to a junction with McCaddam Road. At the junction I turned right on to McCaddam Road and headed down the road (mile 10.8 – 1:03 pm). It was now well after noon and I considered stopping and having lunch alongside the road, but decided to press on and stop once I got back in the woods. After reaching the bottom of the hill I passed Camprathbun Road, the entrance to Lake Demmon Recreation Area. A short distance later I came to my turn-around point, Craig Road (mile 11.5 – 1:18 pm). I took a few pictures and then headed back. I passed Camprathbun Road and started my climb up the hill to the junction with Harris Hill Road. It was a vigorous climb and I worked up a sweat by the time I reached the junction. I was glad that the short walk on Harris Hill Road was downhill. I turned left and soon was back at the trailhead (mile 12.4 – 1:35 pm). After leaving Harris Hill Road I began searching for a good spot to take a lunch break. Near the ATV trails I found a place and decided to break out my hammock (mile 12.7 – 1:41 pm). I hooked my hammock up between two trees, took my boots and socks off, and got my lunch out. It was nice to relax for a little bit. After eating and relaxing I put on fresh socks and pulled my boots back on. I soon came to CR 69 and crossed over (mile 13.3 – 2:35 pm). A short time later I came to the place where I had stopped earlier for a break on the farm road and then turned into the woods along the edge of the field. 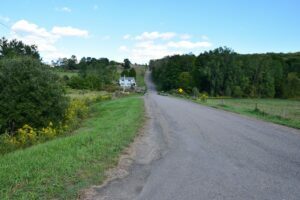 Then I was back on the farm road and turning left to head toward Snell Hill Road. A short distance down the farm road I saw three men in front of me carrying bows; the owners of the pickup trucks I had seen earlier. I was moving faster than they were and soon caught up with them. We chatted briefly before I headed on down to Snell Hill Road (mile 14.2 – 2:53 pm) . I turned off the road and headed back toward the farm I had passed through earlier. 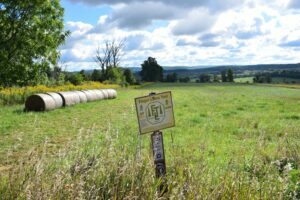 This time I was able to follow the trail through the woods and found that it continued all the way to the farm, it did not run through the field as I had thought. I passed around the white plastic covered hay bales with permanent marker and then down through the farm to Gay Gulf Road (mile 14.6 – 3:02 pm). I still did not see the owners of the farm. At Gay Gulf Road and I turned left to head back down to the stream and then back into the woods. After a short climb up a small field to Robinson Road I crossed over into the much larger field (mile 15.3 – 3:24 pm). Again I had to pick my way carefully across the rutted and rough field. The trail turned into the woods and I continued on. As I neared the trail register I had stopped at earlier a large bird silently took flight from a tree limb; an owl. It was gone before I could even reach for my camera case. 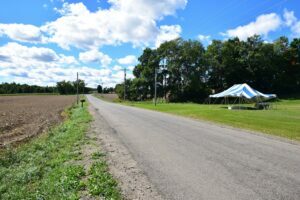 After passing the register I walked down past the corn field and down the farm road to Sinclair Road (mile 16.4 – 3:56 pm). 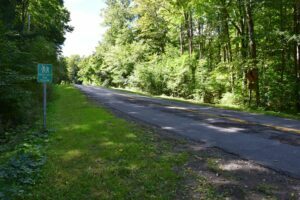 I turned left onto Sinclair Road and made my way down the road to CR 14. I moved quickly down CR 14 and came to the junction with Cochrane Road (mile 17.3 – 4:14 pm). Ahead of me I could see the steep climb of the road; not something I was looking forward to. I plodded up the hill, past the old farm house in the cow pasture; the cows were now elsewhere. I was hot and tired as I reached the top of the hill. The wind had died down so there was no cooling breeze. I took a few more pictures and then headed down to where the trailhead left the road (mile 18.2 – 4:39 pm). I decided to stop and take a rest break before heading down the fields ahead and the overgrown power line right-of-way. A few few large hay bales at the edge of the field provided some shade from the sun where I could sit down and get a break from the warm sun. After some water and a banana I was ready to move on. I followed the fields down, again trying to find my way, but without good markings I was mostly just guessing. I knew the direction I needed to go so I just pressed on. After reaching the large power pole with the white blaze I started down a small track, but I soon lost it. After searching for a blaze or some path I finally gave up and just pushed downhill through the growth. There were small pricker bushes hidden among the weeds that scratched at my ankles and legs. I didn’t care, I just wanted to get down to the road at the bottom of the hill. After slogging through the brush and weeds I finally came to the gully next to Knight Settlement Road and climbed up to the road (mile 19.0 – 5:06 pm). I was tired and it took some effort to climb over the guard rail at the edge of the road. I crossed over and headed back up into the narrow trail that followed the road. Twice I lost the trail and had to back-track. Finally I turned back out to the road (mile 19.7 – 5:29 pm). Since there was no shoulder on the road I had to move to the side every time a car passed by. It was difficult to walk on the edge because it was sloped, so when there were no cars I just walked the white line at the edge of the road and sometimes in the road. Finally I saw the gravel and sand company around a bend in the road – I was getting closer. I crossed the railroad track and then on down the road finally crossing the river. The parking area opened to my left and I could see my car parked on the far side. A short time later I was finally at my car (mile 20.95 – 5:53 pm).